Plot y versus x as lines and/or markers with attached errorbars. x, y define the data locations, xerr, yerr define the errorbar sizes. By default, this draws the data markers/lines as well the errorbars. Use fmt='none' to draw errorbars without any data markers. scalar: Symmetric +/- values for all data points. shape(N,): Symmetric +/-values for each data point. contains the lower errors, the second row contains the upper errors. Note that all error arrays should have positive values. See Different ways of specifying error bars for an example on the usage of xerr and yerr. The format for the data points / data lines. See plot for details. Use 'none' (case insensitive) to plot errorbars without any data markers. A matplotlib color arg which gives the color the errorbar lines. If None, use the color of the line connecting the markers. The linewidth of the errorbar lines. If None, the linewidth of the current style is used. The length of the error bar caps in points. If None, it will take the value from rcParams["errorbar.capsize"]. An alias to the keyword argument markeredgewidth (a.k.a. mew). This setting is a more sensible name for the property that controls the thickness of the error bar cap in points. For backwards compatibility, if mew or markeredgewidth are given, then they will over-ride capthick. This may change in future releases. If True, will plot the errorbars above the plot symbols. Default is below. 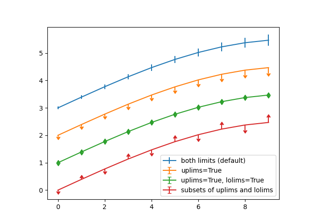 These arguments can be used to indicate that a value gives only upper/lower limits. In that case a caret symbol is used to indicate this. lims-arguments may be of the same type as xerr and yerr. To use limits with inverted axes, set_xlim() or set_ylim() must be called before errorbar(). Subsamples the errorbars. e.g., if errorevery=5, errorbars for every 5-th datapoint will be plotted. The data plot itself still shows all data points. plotline: Line2D instance of x, y plot markers and/or line. caplines: A tuple of Line2D instances of the error bar caps. barlinecols: A tuple of LineCollection with the horizontal and vertical error ranges. where mfc, mec, ms and mew are aliases for the longer property names, markerfacecolor, markeredgecolor, markersize and markeredgewidth. All arguments with the following names: 'x', 'xerr', 'y', 'yerr'.